What was the club member talking about when the above comment was made? The new club challenge, - Easter Monday 9th April 2012, starting at 9 am. At the Dovercourt Navigator Hall, (where the 5k races start). 9 am 5 kilometre handicap race, round our 5 kilometre course. Handicap based on 5k PB for 2011. 10.30 am 800 metres run starting one at a time in order, leader off first, and finish at top of ambulance slope. First person back is the winner, very much like modern pentathlon cross country races. As on handicap and pace judgement we may have some slower runners setting off as race leaders, to be chased by faster athletes. Presentations in the hall at 11 am. Will limit to start with 20 places first come, (first entered). Entries to Peter G by email only with best 2011 5k time and predicted mile time. 2 pound fee payable on the day, fee also payable if you do not turn up on day. An Easter egg to all finishers. The higher you finish overall, the bigger the Easter egg received. So in answer to your questions from last night when I first announced it, how will it work? At 9 am the 5k races starts on our 5k series course starting in the park. Runners will start as they do in the 5k series or the club 5 mile handicap races, slowest goes off first. Handicaps will be based on your best 5k time of 2011. The first person to finish, will at this point be the leader and first to start in the 800 meter run. If you finish 65 seconds behind the winner of the 5k you will start 65 seconds behind the first person in the 800, for example. At 10 am all start together on the one mile pace judgement competition. The aim is to get as close as possible to your predicted time. Example; a runner predicts 8 minutes and finishes in 7.40, 20 seconds out. This runner finished 5 seconds behind the first finisher in the 5k. Therefore this runner starts the 800 mts run 25 seconds behind the first runner to start, (20 + 5 seconds). The same would apply if the runner finished in 8 mins 20 seconds, (still 20 seconds out on predicted time). Please note; you do not have to predict your fastest time, just predict a time then try to run it without a watch. Example; a runner capable of running a mile in 6 mins may want a easy run so predicts 8 mins so as to have a recovery between the 5k and 800 mts races. 10.30 am, start of 800 mts run. The leader starts first and all others start based on the above. 11 am Presentation of prizes in Navigator Hall. We have hired the hall for the morning, so personal belongings can be left here whilst running. The race organisers decision is final and may not be challenged, (for personal safety reasons the race organisers will not be named). Entries open 10 pm on Thursday 8th March, (tomorrow evening). Entry via email to pgooding@talktalk.net with Easter Challenge in the subject line. Email must include the following info; your name, 2011 5k PB time, (if known), and predicted mile time. Payment on the day £2 per runner, anyone who fails to turn up must pay the entry fee. Entry limited to first 20 to apply. Helpers/Marshals will be required on the day please. If this proves popular and is a success it will become an annual event and hopefully we will be able to take more runners next year. We would stress this is a trial event. Since preparing this info the organisers are considering slight changes; to take 25 runners and allow 5 runners to go on a reserve list and to change the 800 to 1000 mts. These are only thoughts at the moment and may not be implemented. 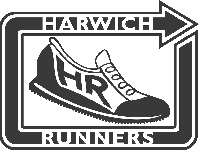 Harwich Runners - Probably the best little running club in the World.